You can use Portal for ArcGIS or ArcGIS Online with Event Editor to configure security for the application. Use the following steps to register Event Editor. Log in to your Portal for ArcGIS or ArcGIS Online account. The Application dialog box appears. Choose Web Mapping as the type of item. Choose Ready to Use as the purpose of the app. Type the URL of the application. Type the name of the app in the Title text box. Type tags in the form of words or short phrases that describe your item. Click on the item you just added from the list of items. Register Event Editor with your portal by clicking Register in the App Registration section. Choose Browser as the app type. Specify the Redirect URL, which should be the server hosting your Event Editor web application. Once you have registered your app, you will be provided with an app ID. For more information on how to register the app with Portal for ArcGIS, see Register your app. Copy the ID that was provided. Open the Event Editor configuration file (config.json) within the EventEditor web folder. This folder may be located at <Installation location>\Server\Web\ Event Editor. 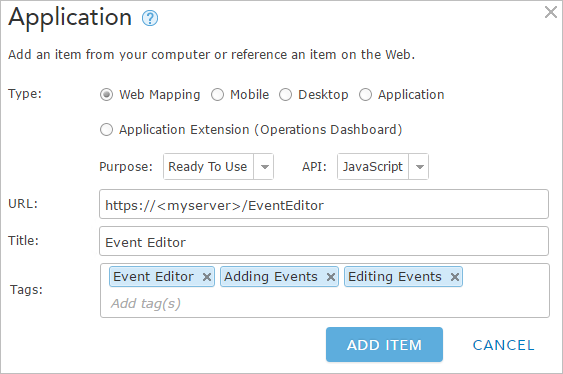 Browse to the portalAppId section and paste the app ID provided when you registered Event Editor. Publish and configure the map service.